The first in history meeting between the patriarch of Moscow and the pope of Rome, which had been on the agenda for 20 years, was held in Havana on February 12. 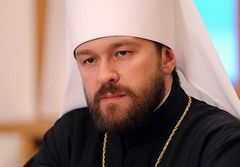 Head of the Synodal Department for External Church Relations Metropolitan Hilarion of Volokolamsk tells Interfax-Religion correspondent Alexey Sosedov about its results, influence on settling the main problem existing between the two Churches, fears about Orthodox and Catholics closing up, and prospects of the pope's visit to Russia and the patriarch's visit to Rome. - Your Eminence, what do you think about results of the meeting between Patriarch Kirill and Pope Francis? - Much is said that it is the first meeting in history, that there has never been such a meeting before, but I think that the most important about it is the content of the meeting. It is certainly pleasant to see the pope and the patriarch together, talking to each other in a fraternal atmosphere, smiling to each other. But the most important is the content of the meeting, which was fully reflected in the mutual declaration signed by the patriarch and the pope. I think this declaration for a long time will be a guidance for Christians of the two confessions: Orthodox and Catholic. The declaration also contains important words about the Gospels as shared grounds for believers of the West and the East, about the way to realize the Gospels commandments in difficult contemporary conditions. This declaration is a guidance for action. - Will this historic event influence the settlement of the main problem existing in relations between the two Churches: actions of the Greek-Catholics (Uniates) in Ukraine? - The mass media have recently published a reaction from an archbishop of the Ukrainian Greek-Catholic Church to the joint declaration adopted by the pope and the patriarch. This reaction was very negative, very insulting not only to our side, but also to the pope. Those statements show that the administration of the Ukrainian Greek-Catholic Church has not changed its position. They are not ready to hear not only the voice of our patriarch, but even the voice of their pope. They have their own politicized agenda, they have their own clients, they are fulfilling these orders, and even the pope is not an authority to them. - What mutual steps are necessary to bring Uniates to reason? Perhaps, we should expect that the Russian Church and the Catholic Church will set up a commission. - There is an idea of the creation of some commission that would help resolve the problem of the Unia, but the specific parameters of this commission are now difficult to imagine, especially bearing in mind the way the leaders of the Ukrainian Greek-Catholic Church are thinking. In the early 1990s, a four-party commission was created to resolve specific, practical issues relating to the existence of Orthodox Christians and Greek-Catholics in Western Ukraine. However, the Greek-Catholics unilaterally left that commission, they did not want to participate in it. I think this is due to the fact that they don't want to walk the path that is now outlined by the pope and the patriarch in their joint declaration. The way offered by the pope and the patriarch is the way of interaction in the areas where such interaction is possible. It's the path of halting the rivalry and transitioning to brotherly relations. And the Greek-Catholics don't need that at all. Their rhetoric is aggressive, hostile and loose, and it is in very sharp contrast not only with the content of the declaration, but also its style, its ministerial message, the reconciliating spirit coming from it. - Many journalists are interested if the pope will come to Russia. - This topic was not discussed at the meeting. Perhaps, everyone is interested, but I don't have a feeling that the pope cares much about it. At least, it was not voiced at the meeting. Neither the pope's visit to Moscow nor the patriarch's visit to Rome is under consideration now. What the two Сhurches should focus on at the moment is stepping up interaction, expanding mutual understanding, and trying as soon as possible to overcome the negativity that has accumulated in relations between the Orthodox and the Catholics and working toward to bring minds and hearts closer together. And then the time will show us what to do. I think that when there will be conditions for the next meeting, we will decide where and when to hold it. - Are the Churches going to develop pilgrimage? - The pope and the patriarch said at the meeting that we should be more open to each other in the field of pilgrimage. For example, a big flow of Orthodox pilgrims comes to relics of St. Nicholas in Italian Bari. Pilgrims from the Catholic Church also come to Orthodox shrines. We can intensify these two flows, as it is very important for people to meet each other, to have access to shrines of the other Church. - Is it possible to bring relics of Sts Peter and Paul from Rome or St. Jacob from Spain to Russia? - I consider it quite possible. I think our believers will be spiritually inspired if relics of the saints venerated in our Church, but kept in the Catholic Church, are brought to Russia. The reverse movement is certainly possible, I mean the shrines of the Russian Orthodox Church can be taken to the West so that believers of the Catholic Church can venerate them. - Can we expect it in the nearest future? - I think the first exchange of shrines is possible during the year. - How will the Russian and the Catholic Churches protect traditional moral values now? - As to the protection of traditional moral values, we absolutely agree with the Catholic Church. We consider a marriage the union between the man and the woman for giving birth and bringing up children. We consider it necessary to protect human life from the moment of conception to natural death. We are against abortions. There were very powerful words in the declaration to protect life, to protect the right of each person for life. I think we will intensify our interaction in these directions. - We have recently learned that nuncio Ivan Jurkovic was moved from Moscow to Geneva. Is it somehow connected with the meeting of the pope and the patriarch? Do you know who will be the next nuncio? - We do not know who will be the next nuncio. I learned from the mass media that Archbishop Ivan Jurkovic is appointed to Geneva. Appointment of nuncios is Vatican's internal affair, Vatican as a state. An apostolic nuncio is an ambassador of the Vatican state to other states. So appointments of nuncios is not a question of inter-church relations. This appointment should be in no way considered as the consequence of our discontent with the nuncio. On the contrary, we had very good relations with Nuncio Ivan Jurkovic as well as with his predecessor. We do not have any claims to him. We are thankful to him for the constructive cooperation. I think his appointment is connected with the rhyme of changing nuncio each four years, the same as ambassadors. Nuncio Ivan Jurkovic was in my TV program a day or two before our trip to Havana, we had a nice conversation. I heard that his new appointment is being prepared, but I did not have a chance to ask him about it. - Some Orthodox believers are afraid of closing up with Catholics as they see the danger of almost full merger of Orthodox and Catholic Church. What can you say to these people? - First of all, I would like to recommend them to read the declaration of the pope and the patriarch attentively, it shows what they talked about. There was not any attempt of closing up the teaching, the dogmatic or theological questions were not discussed. Such discussion is not on the agenda today. The declaration starts with the message that loss of the God-commanded unity is a violation of the commandment of Christ voiced in his last high-priestly prayer: "may all be one." Unfortunately, Christians did not manage to keep this unity, Christians of the East and of the West are divided, they do not participate in Eucharist together. Today, we do not speak about overcoming this division, but we speak about learning to live and work in this world as brothers, not rivals in order to protect the values we share, to preach Gospels together, to open God's truth to people. Today we can do these things together. I like the words Raul Castro said at his meeting with Patriarch Kirill, when the patriarch was telling him about yet coming meeting with the pope. President Raul recalled the proverb that every road, even the longest one, starts with the first step. This step has been done and now I hope that believers of the two traditions will walk along this long road together, not making any compromises with their conscience, not making doctrinal compromises, but protecting the things we share.